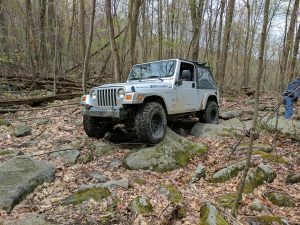 Back in April, I was invited out to the central part of PA to check out the Rock Run Recreation Area. 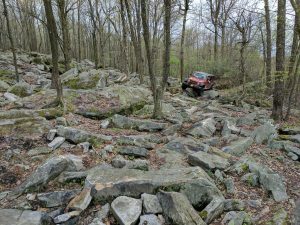 I wheel with a couple who are locals in the area, and helped cut some of the trails at Rock Run with various groups over the years. 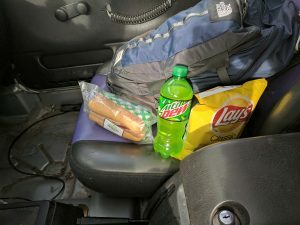 It was about a 4 hour drive out there for me, So I took a Friday off of work, and made the road trip in the LJ. I was heading out there for two reasons, one was to check out Rock Run, but the other was to get some RTI numbers for the Currie Anti-Rock article I wrote some time ago. Rock Run isn’t new, and much like the AOAA it has backing and oversight from some local government agencies. Folks who have wheeled AOAA will tell you how tight some of the trails are, and this is because of regulations placed on the park that dictate the size of tree”s which are allowed to be cut down. Rock Run has a similar limitation. So when new trails are cut, larger trees need to be taken into consideration. So the trails will snake around in an attempt to keep all of the older trees. First, I’d like to throw something out there. This park is pretty big, and it’s got some great trails. There’s a problem though, at least a problem for folks like You and I, who drive full size vehicles, and not ATV’s. This park has a definite ATV focus. Go have a look at their trail map. You’ll see that there are a spaghetti of ATV and single track trails of varying difficulties, and only a hand-full of jeep trails. I was given some back story on some issues with ATV and Full Size vehicles sharing trails which lead to the unfortunate closures of some full size trails. I won’t get too deep into this though. I don’t have first hand knowledge of it, and while I trust the people who told me about it, I don’t want to spread bad press. let’s focus on the good! If you like tight technical trails, rock run’s full size trails will be right up your alley! We hit most of the Jeep trails in one day. While it’s unfortunate that we were able to hit (from what I’m told) all of the decent trails in just one day, they were really fun trails. I’d say you could make a weekend out of this park if you repeat some of the more interesting trails, or maybe run them frontward and backward. I got a pile of gimbal dash footage from our day on the trails. The gimbal did great, it really let me capture the ups, downs, and off-cambre of this park. The first trail we hit was called sidewinder, and the name fit! This trail snaked through the trees and hit all of the rocks littered about. 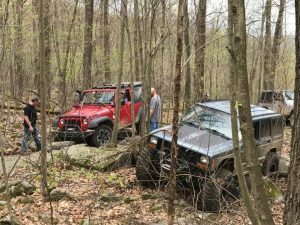 It ended in this great rock garden, which I had to bypass, my LJ on 33’s just wasnt up to that. What I loved about sidewinder was the amount of attention you had to pay to where the trail went, and how nonstop the rocks were! If you’re into rocks, and tight technical trails, RUN THIS TRAIL! It’s a blast! The LJ did really well, considering i’m still open/open, and on mostly stock suspension. I hadn’t even installed my new control arms yet. Maybe that’s why my stock CA’s were in such horrible shape when I removed them… I’m also pretty sure I got my oil pan dent at Rock Run, but I can’t say where. Sidewinder took us most of the morning, in the afternoon we hit some more dirt trails that were also very hilly and off-cambre. You can see them in the video. Lots of ups and downs, and flexy flexy. I have to say that, again, the LJ did great. Overall, I’d say that Rock Run is worth the trip. I’d go again if the opportunity arose. Someday when I have some lockers, and a bit more clearance I want to run that rock garden at the end of sidewinder!